The Appear TV chassis has 6 slots for modules from the whole range. This allows very compact combinations of input, processing and output modules to be assembled. 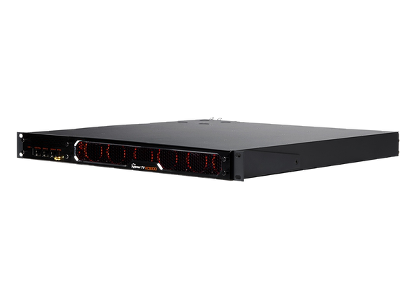 The Appear TV 1 RU chassis allows very high density designs for IPTV, DVB turnaround, cable head ends, channel insertion for regional multiplexing, bulk decryption, encryption and terrestrial and satellite transmission systems. Appear TV is dedicated to providing world class equipment that enable operators to deliver professional broadcast services at the highest possible quality. Their portfolio is built around modular platforms hosting a wide selection of interoperable modules that give unparalleled configuration possibilities. Through its clever and robust design, the integrated architecture offers superior reliability that can meet even the most demanding operator requirements.